The Buddha had gone beyond all worldly affairs, but still gave advice on good government. The Buddha came from a warrior caste and was naturally brought into association with kings, princes and ministers. Despite His origin and association, He never resorted to the influence of political power to introduce His teaching, nor allowed His Teaching to be misused for gaining political power. But today, many politicians try to drag the Buddha's name into politics by introducing Him as a communist, capitalist, or even an imperialist. They have forgotten that the new political philosophy as we know it really developed in the West long after the Buddha's time. Those who try to make use of the good name of the Buddha for their own personal advantage must remember that the Buddha was the Supremely Enlightened One who had gone beyond all worldly concerns. The thrust of the Buddha Dhamma is not directed to the creation of new political institutions and establishing political arrangements. Basically, it seeks to approach the problems of society by reforming the individuals constituting that society and by suggesting some general principles through which the society can be guided towards greater humanism, improved welfare of its members, and more equitable sharing of resources. by dukkha (unsatisfactoriness), anicca (impermanence), and anatta(egolessness). To the Buddhist, nowhere in Samsara is there real freedom, not even in the heavens or the world of Brahama. Although a good and just political system which guarantees basic human rights and contains checks and balances to the use of power is an important condition for a happy in society, people should not fritter away their time by endlessly searching for the ultimate political system where men can be completely free, because complete freedom cannot be found in any system but only in minds which are free. To be free, people will have to look within their own minds and work towards freeing themselves from the chains of ignorance and craving. Freedom in the truest sense is only possible when a person uses Dhamma to develop his character through good speech and action and to train his mind so as to expand his mental potential and achieve his ultimate aim of enlightenment. 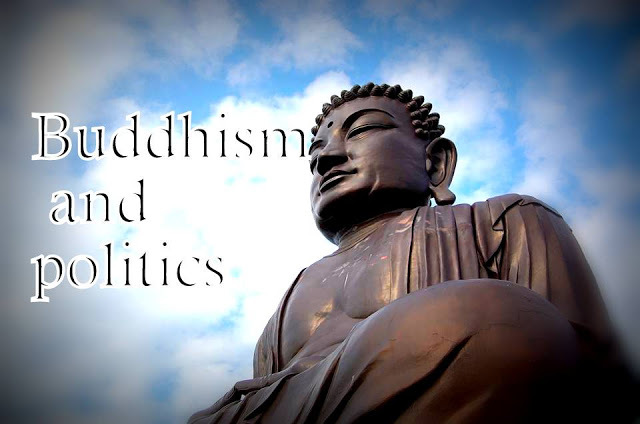 While recognizing the usefulness of separating religion from politics and the limitations of political systems in bringing about peace and happiness, there are several aspects of the Buddha's teaching which have close correspondence to the political arrangements of the present day. Firstly, the Buddha spoke about the equality of all human beings long before Abraham Lincoln, and that classes and castes are artificial barriers erected by society. The only classification of human beings, according to the Buddha, is based on the quality of their moral conduct. Secondly, the Buddha encouraged the spirit of social -co-operation and active participation in society. This spirit is actively promoted in the political process of modern societies. Thirdly, since no one was appointed as the Buddha's successor, the members of the Order were to be guided by the Dhamma and Vinaya, or in short, the Rule of Law. Until today very member of the Sangha is to abide by the Rule of Law which governs and guides their conduct. Fourthly, the Buddha encouraged the spirit of consultation and the democratic process. This is shown within the community of the Order in which all members have the right to decide on matters of general concern. When a serious question arose demanding attention, the issues were put before the monks and discussed in a manner similar to the democratic parliamentary system used today. This self-governing procedure may come as a surprise to many to learn that in the assemblies of Buddhists in India 2,500 years and more ago are to be found the rudiments of the parliamentary practice of the present day. A special officer similar to 'Mr. Speaker' was appointed to preserve the dignity of the Parliamentary Chief Whip, was also appointed to see if the quorum was secured. Matters were put forward in the form of a motion which was open to discussion. In some cases it was done once, in others three times, thus anticipating the practice of Parliament in requiring that a bill be read a third time before it becomes law. If the discussion showed a difference of opinion, it was to be settled by the vote of the majority through balloting. The Buddhist approach to political power is the moralization and the responsible use of public power. The Buddha preached non-violence and peace as a universal message. He did not approve of violence or the destruction of life, and declared that there is no such thing as a 'just' war. He taught: 'The victor breeds hatred, the defeated lives in misery. He who renounces both victory and defeat is happy and peaceful.' Not only did the Buddha teach non-violence and peace, He was perhaps the first and only religious teacher who went to the battlefield personally to prevent the outbreak of a war. He diffused tension between the Sakyas and the Koliyas who were about to wage war over the waters of Rohini. He also dissuaded King Ajatasattu from attacking the Kingdom of the Vajjis. In the Kutadanta Sutta, the Buddha suggested economic development instead of force to reduce crime. The government should use the country's resources to improve the economic conditions of the country. It could embark on agricultural and rural development, provide financial support to entrepreneurs and business, provide adequate wages for workers to maintain a decent life with human dignity. In the Milinda Panha,it is stated: 'If a man, who is unfit, incompetent, immoral, improper, unable and unworthy of kingship, has enthroned himself a king or a ruler with great authority, he is subject to be tortured‚ to be subject to a variety of punishment by the people, because, being unfit and unworthy, he has placed himself unrighteously in the seat of sovereignty. The ruler, like others who violate and transgress moral codes and basic rules of all social laws of mankind, is equally subject to punishment; and moreover, to be censured is the ruler who conducts himself as a robber of the public.' In a Jataka story, it is mentioned that a ruler who punishes innocent people and does not punish the culprit is not suitable to rule a country. The Buddha'semphasis on the moral duty of a ruler to use public power to improve the welfare of the people had inspired Emperor Asoka in the Third Century B.C. to do likewise. Emperor Asoka, a sparkling example of this principle, resolved to live according to and preach the Dhamma and to serve his subjects and all humanity. He declared his non-aggressive intentions to his neighbors, assuring them of his goodwill and sending envoys to distant kings bearing his message of peace and non-aggression. He promoted the energetic practice of the socio-moral virtues of honesty, truthfulness, compassion, benevolence, non-violence, considerate behavior towards all, non-extravagance, non-acquisitiveness, and non-injury to animals. He encouraged religious freedom and mutual respect for each other's creed. He went on periodic tours preaching the Dhamma to the rural people. He undertook works of public utility, such as founding of hospitals for men and animals, supplying of medicine, planting of roadside trees and groves, digging of wells, and construction of watering sheds and rest houses. He expressly forbade cruelty to animals. Sometimes the Buddha is said to be a social reformer. Among other things, He condemned the caste system, recognized the equality of people, spoke on the need to improve socio-economic conditions, recognized the importance of a more equitable distribution of wealth among the rich and the poor, raised the status of women, recommended the incorporation of humanism in government and administration, and taught that a society should not be run by greed but with consideration and compassion for the people. Despite all these, His contribution to mankind is much greater because He took off at a point which no other social reformer before or ever since had done, that is, by going to the deepest roots of human ill which are found in the human mind. It is only in the human mind that true reform can be effected. Reforms imposed by force upon the external world have a very short life because they have no roots. But those reforms which spring as a result of the transformation of man's inner consciousness remain rooted. While their branches spread outwards, they draw their nourishment from an unfailing source -- the subconscious imperatives of the life-stream itself. So reforms come about when men's minds have prepared the way for them, and they live as long as men revitalize them out of their own love of truth, justice and their fellow men. However, this does not mean that Buddhists cannot or should not get involved in the political process, which is a social reality. The lives of the members of a society are shaped by laws and regulations, economic arrangements allowed within a country, institutional arrangements, which are influenced by the political arrangements of that society. Nevertheless, if a Buddhist wishes to be involved in politics, he should not misuse religion to gain political powers, nor is it advisable for those who have renounced the worldly life to lead a pure, religious life to be actively involved in politics.